• Helps maintain a stable blood pressure. • Performs antioxidant functions, and protects against lipid oxidation. • Protects the body from free radicals responsible for cell aging processes. • Supports healthy brain functions. Recommended daily intake of the product(1 capsule) contains: Coenzyme Q10 100 mg. Ingredients: Filler material (soybean oil), gelatin, coenzyme Q 10 (ubiquinone), humectant (glycerol), emulsifier (soy lecithin), water, thickener (white beeswax),pigments (iron oxide, titanium dioxide). Recommended daily intake of the product: 1 capsule. 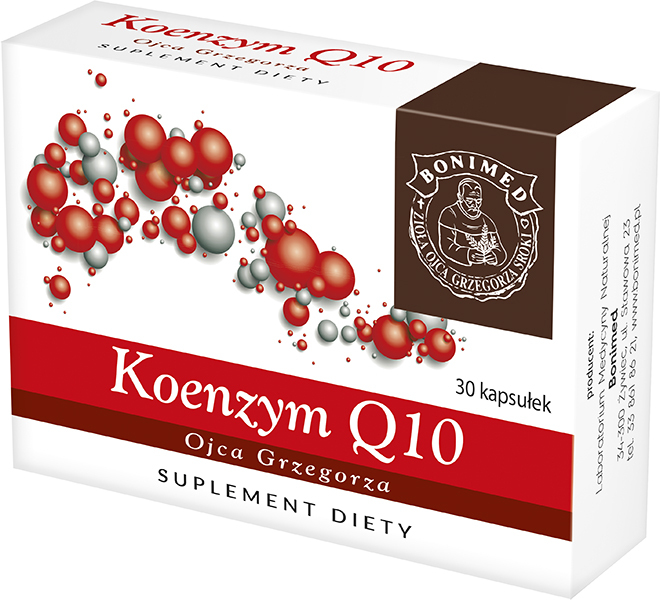 Coenzyme Q10 absorption from the gastrointestinal tract works better in the presence of fat. We recommend taking the product right after a meal. Caution: Dietary supplements should not be treated as a substitute (replacement) of a varied diet.Do not exceed recommended daily intake during the day. A healthy lifestyle, including a balanced diet is the best way to maintain good health.Taking the product by children is not recommended.If you are pregnant or breastfeeding, talk to your doctor first. Don’t use it if you are allergic to the product ingredients. Coenzyme Q10 may increase the effect of diuretics, nitrates, and cardiac glycosides. It may inhibit the anticoagulant effect of coumarin derivatives, e.g. warfarin.